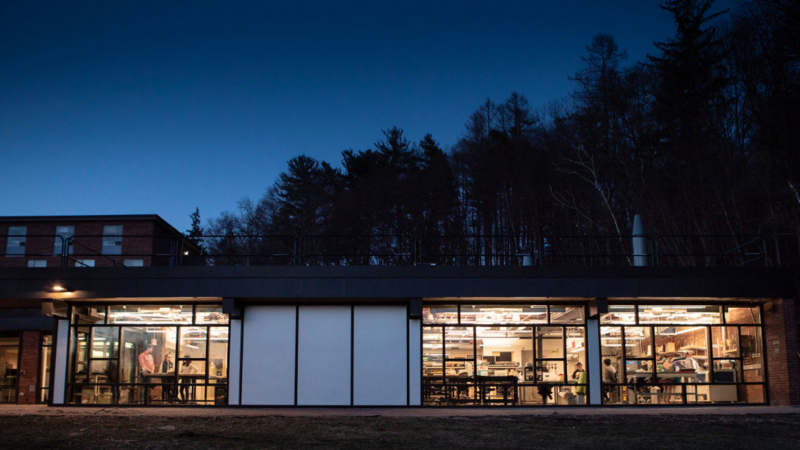 Before taking the fall 2018 course Making the Past: Geosciences in the Makerspace, I had never stepped foot in the Mount Holyoke Makerspace (which has since been relocated, expanded and renamed the Fimbel Maker & Innovation Lab). I had heard about the makerspace through advertisements for staff-led events and from friends who had taken classes there. 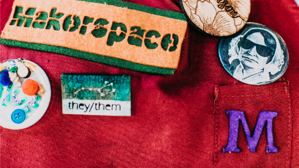 I also knew that it was different from makerspaces at other colleges, which friends reported were only available to people with certain majors or were so restrictive that it was nearly impossible to reserve a time to use the equipment. I knew that ours was accessible for all Mount Holyoke students. I’d just never had a reason to use it. Until I signed up for a 100-level class. 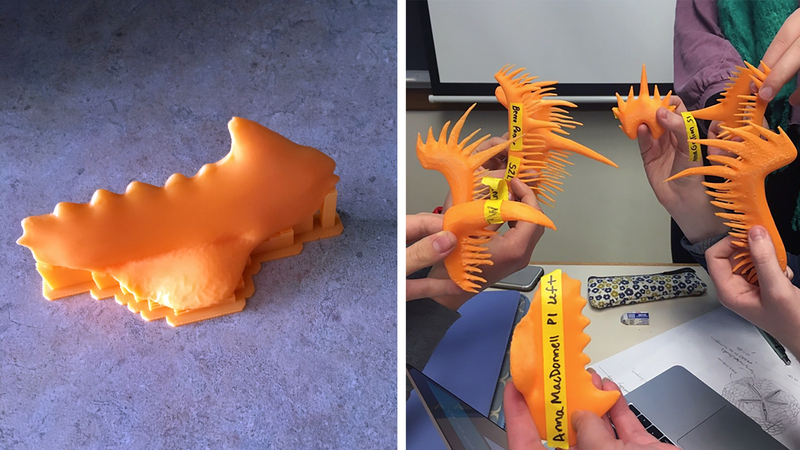 Part lecture, part design workshop, the class promised to explore dinosaurs and ancient species by utilizing high-tech equipment, which sounded like an intriguing combination. Early in the semester, Professor of Geology Mark McMenamin outlined our first assignment. We were to use a 3D printer to recreate a conodont element, which is a tooth fossil of an ancient fish that resembles an eel. Conodonts are significant because they are the earliest teeth found in the fossil record. After we were each assigned one of the conodont elements, the professor brought in colleagues to introduce us to different computer programs. First, professional video editor Matt Lafreniere helped us use Pixologic’s Sculptris program to mold a 3D ball into our element. This involved downloading a photo of the our element to appear behind the 3D ball, then forming the ball to match the shape of the image. From left, detail of MacDonnell’s conodont element, before the printing supports were removed, and a collection of class elements. Shani Mensing ’15, Fimbel Lab coordinator and technical specialist, was essential to the class. She was always there to walk us through how to use the equipment. First we had to download our Sculptris file to a computer connected to the 3D printer, adjust the settings of the printer, and add supports to the element so it wouldn’t collapse during the printing process. The printing process itself took a few hours. With Shani’s help, everyone eventually printed their elements. We then arranged these to form a full set of conodont teeth, which we left in the makerspace. 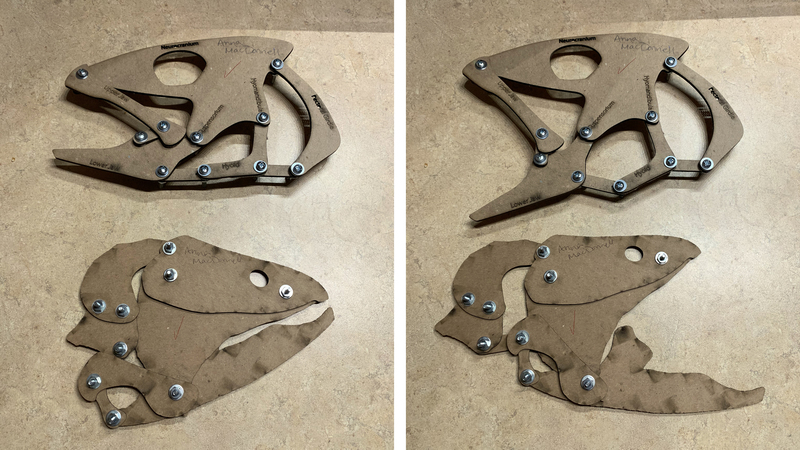 For our next assignment, we learned how to use the laser cutter to create ancient fish skulls out of cardboard. We then assembled the pieces to learn about the jaw movements of different types of fish, which revealed that certain fish jaws evolved so they could unhinge in order to more easily eat their prey. Also as a class, we built a life-sized skull of a hadrosaur — a family of duck-billed herbivorous dinosaurs — in order to consider which possible sounds it could have made. We learned that hadrosaurs had a thin, straight piece of bone that stuck up on top of the skull, with hollow bags of skin on either side of it. Some paleontologists believe these bags helped the dinosaur make a unique sound to communicate with mates and other hadrosaurs. Class guest and musician Robert Eisenstein, director of the Five College Early Music Program and Five College senior lecturer in music, helped us better understand how instruments relate to dinosaurs. Eisenstein brought in a few types of instruments, both with and without reeds, so we could hypothesize which of the different sounds may have most closely resembled the sounds of the hadrosaur. 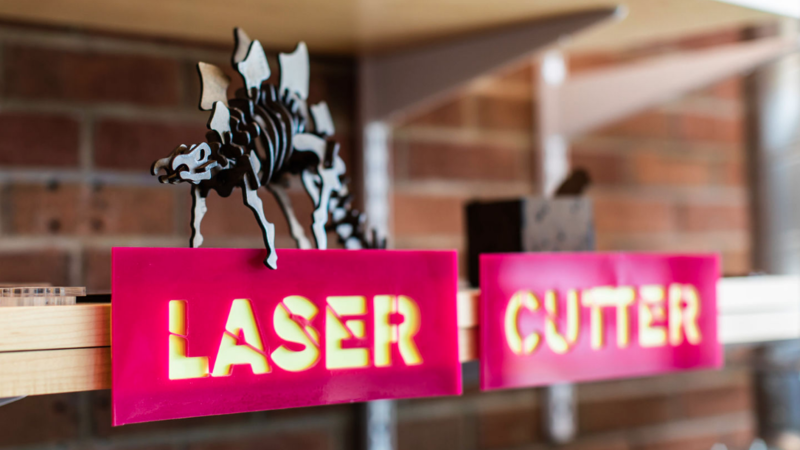 Geosciences in the Makerspace was unlike any other class I’ve taken at Mount Holyoke, and it opened my eyes to the opportunities to learn and create that are available through the Fimbel Maker and Innovation Lab. It was especially cool to learn how to use high-tech machinery and to meet staff and professors across campus. I am also way more comfortable using the space. I’ve since returned to make buttons for the College Democrats club and to laser cut paper into various things, such as leaves to put on a bulletin board I decorated for my floor in my role as a community advisor in a residence hall. My advice to fellow students? 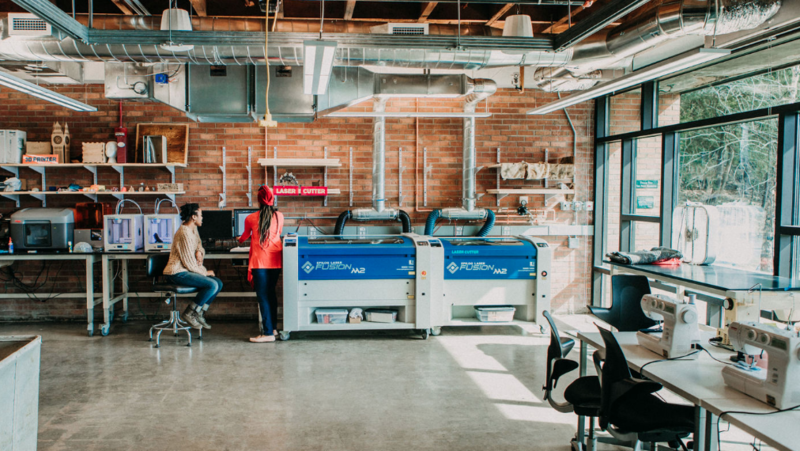 Know that in addition to the classes that are taught in the Fimbel Maker and Innovation Lab, there are also open hours every day for anyone on campus to come in and learn how to use the equipment from Shani and the student staff. The staff also plan events throughout the year for the whole campus. One of their most popular events involves creating customized chocolate molds — and chocolates — for Valentine’s Day. Most importantly, know that the resources and people at the Fimbel Lab are there to support your growth! 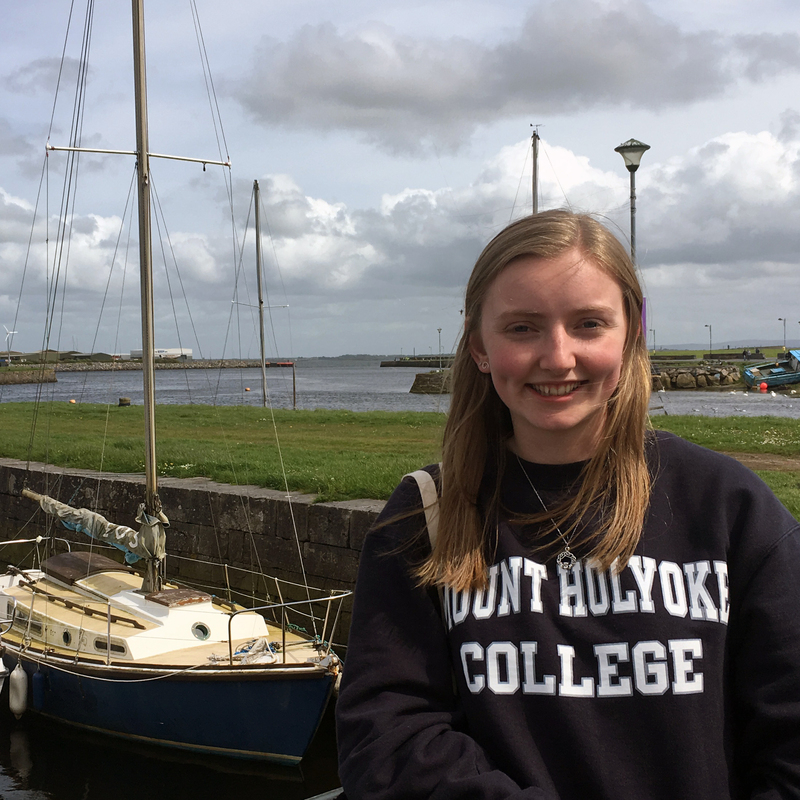 Is Mount Holyoke right for you? Anna MacDonnell ’21 is from Longmeadow, Massachusetts. As a Romance languages and cultures major, she studies French and Spanish. After graduation, she hopes to join the Peace Corps and then possibly pursue grad school. On campus, MacDonnell is on the executive board for the College Democrats club and serves as a community advisor in a residence hall. She is also a member of the UMass Amherst Irish dancing club.